February 1897 was filled with productive work for Gauguin. Immersed in creativity on an exotic island, the painter regularly sends his completed works to the continent through the cruiser “Duge-Truen” and ship’s doctor Guze. Acquainted on an island with a completely different aesthetics, Gauguin not only absorbed the new norms, but also sought to acquaint the Europeans with this wild beauty of Tahiti and its inhabitants. And now the cruiser is again preparing to go home, and Gauguin does not manage to finish the canvas. Closing himself at home, he, working a long clock to a number, completes the picture – the master at all costs, I wanted to send this new portrait of a naked Tahitian woman by this flight. The painting, which the painter so hurried to finish, was called Nevermore. On the rich bed lies a young naked girl. In the background, the artist painted two people in the doorway, talking about something lively. Ornately decorated walls do not immediately reveal a crow sitting on a window. In the corner of the work there is an inscription in English – Never More, which means “Nevermore”. Some researchers see in this inscription and a black bird a reference to the most famous work of Edgar Po – “Raven”. Indeed, there is a line in the poem where the raven pronounces a phrase that coincides with the name of the picture. For the embodiment of the plot, the painter chose gloomy tones, which create anxiety and a certain alertness. Such feelings are read on the face of the heroine – she listens anxiously to the conversation, surreptitiously looking after the bird, then for chatting people. The technical embodiment corresponds to the usual style of the master – thick brush strokes, expressive colors, clarity of lines. On the deep meaning of this picture you can argue a lot and for a long time, which many art historians and researchers of Paul Gauguin are engaged in. However, the master himself argued that the most valuable thing in the work that was not fully expressed. 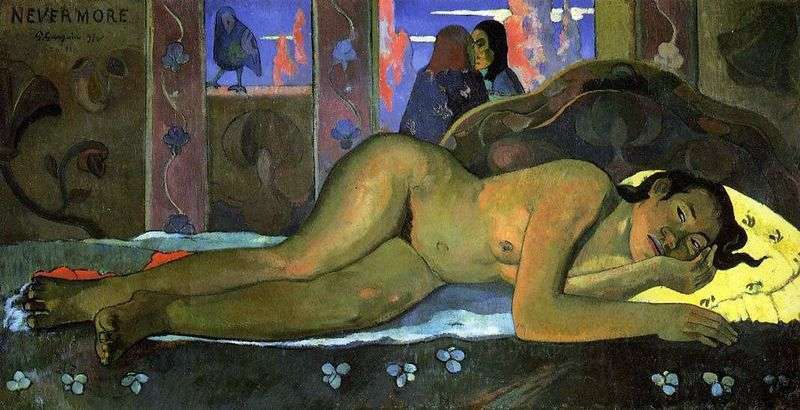 That is why any picture of Gauguin, especially his work of the Tahitian period with program names can have more than a dozen different interpretations. Today, thanks to the roentgenogram, it is for certain that the painting “Nevermore” was written on top of another picture. Description and meaning of the painting Never again by Paul Gauguin.